Indonesia needs a military transport plane after one of its C-130 Hercules aircraft crashed recently. RBTH looks at Russian alternatives to the C-130, and other options for the modernization of the Indonesian Air Force. After a C-130 Hercules military transport plane crashed in Indonesia and claimed 140 lives, the country's air force said it would conduct “market research to find a replacement for these aircraft and upgrade its fleet.” The United States, France and Russia were named as some of the countries that could supply replacements for ageing Indonesian aircraft. RBTH looks at Russian alternatives to the C-130, and other options for the modernization of the Indonesian Air Force. It is worth noting that complete analogs of the C-130 are not produced in Russia at the moment. The An-12, which was a direct competitor of the Hercules, is being phased out of the Russian Air Force and will be replaced by an up-to-date Russian-Indian aircraft. Indonesian Brigadier General Jundan Eko Bintoro, who said the country is looking to replace its fleet of C-130s, named aircraft such as the Boeing C-17 and A400M among the possible replacements. Russia has a very important advantage over its competitors– the reliability of supplies. The Indonesian Air Force’s current fleet is mostly devoid of European and American aircraft, since the U.S. and EU imposed an arms embargo on the country in the late 1990s, which was only lifted in 2005. Russia, since the Soviet era, has been a reliable supplier of military products to the country. The first deals were concluded as early as in 1960. So what might interest the Indonesian military in the arsenal of Russian aircraft manufacturers? This is a modification of the Il-76. The Russian military took a liking to the new plane, and ordered 39 aircrafts. The only thing the Il-476 has in common with its predecessor is the fuselage. New engines were installed and a modified wing was used for the Il-476. The plane also has a new control system, new fuel system, new autopilot, a new digital sighting and navigation system, as well as a ‘glass’ cockpit (controls were made using LCDs). The Il-476 is capable of carrying loads of up to 60 tons with a cruising speed of 770-800 km/h over a distance of up to 5,000 km. The multi-purpose transport aircraft (MTS) is a joint project between Russia and India. It was created to replace the An-12, An-26 and An-72. The project's research and development documentation is being completed at the moment. The Il-214 can be operated in mountainous areas. It can also land on unpaved runways. 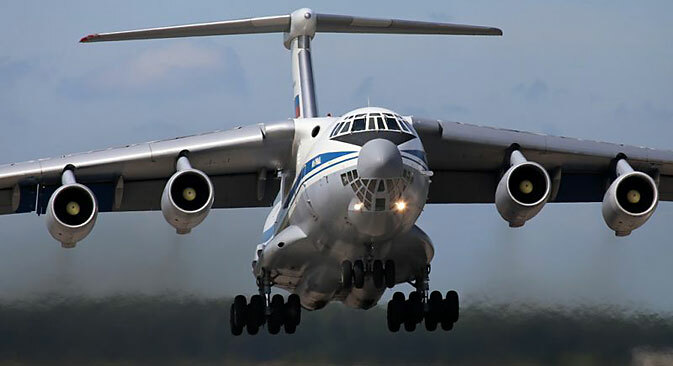 The dimensions of the prospective aircraft’s cargo hold correspond to the characteristics of the Il-76, but at the same time, it is a lighter class of aircraft capable of carrying only up to 12 tons over a distance of up to 3,700 km or 20 tons over a distance of up to 2,000 km. This versatile aircraft is also in a developmental stage. It can replace both the An-12 and the heavier Il-76 on middle-distance flights. Like other Russian military transport aircraft, it can be operated from unpaved runways. It is similar to the civil version of the Tu-214, which is already being produced. In case of an urgent order, the aircraft can be designed and certified in a very short time. Tu-330 can carry up to 35 tons over a distance of up to 3,000 km, and with a load of 20 tons, can fly over 5,600 km. This small military transport aircraft is another model that could potentially interest the Indonesian Air Force. The development of the aircraft was resumed in 2013, when it became clear that a joint project with Ukraine (An-140-100), does not meet the quality and cost requirements of the Russian Air Force. The Il-112V is significantly different from the other models. It is a turboprop (like the A400M). These aircraft are designed to carry up to 6 tons of cargo over a distance of 6,000 km. The aircraft can be used for takeoff and landing on short runways, with a length of 800-1000 meters. An important feature of the Il-112V is an increased width and height of the cargo hold. If the Indonesian Air Force immediately needs a plane, it can only purchase the Il-476 from Russia. Indonesia will have to wait for all other models until about 2019. Indonesia also has the option of following India’s example and jointly manufacture the Il-112, MTS, or Tu-330. In this case, Jakarta will be able to fulfill its demands to the maximum, and get access to production, repair and maintenance technology. Such a scenario is hardly possible with the U.S. or EU. A recent example is India’s purchase of Rafale aircraft, where France won the tender, but took a very tough stand on technology transfer.